They look lifted from the pages of science fiction: like industrial monoliths from "Blade Runner," or the Martian pods in "War of the Worlds." But these giant towers, looming over the skyline of Delhi, India, land with benevolent intentions. "The Smog Project," designed by Dubai-based architecture firm Znera Space, is an ambitious proposal to clean the air in one of the world's most pollution-blighted cities. Delhi's citizens are on the frontlines of a smog crisis. During a particularly bad spell in late 2017, air quality was so poor breathing it was equivalent to smoking 44 cigarettes a day. Data from the World Health Organization shows Indian cities dominate the top 20 most-polluted cities globally in terms of PM2.5 levels -- atmospheric particles less than 0.0025mm (0.000098 inches) wide, the smallest and most dangerous size of airborne pollution. Globally, the health implications of air pollution are profound, causing about 4.2 million deaths in 2016 and with links to 3.2 million new diabetes cases annually and impaired cognitive ability, according to recent studies. "It's a conversation starter," says Najmus Chowdhry, principal architect for the concept. Chowdhry, raised in Chandigarh, approximately 150 miles north of Delhi, describes the nation's capital as "like a gas chamber," but says politically "everyone is passing the buck." 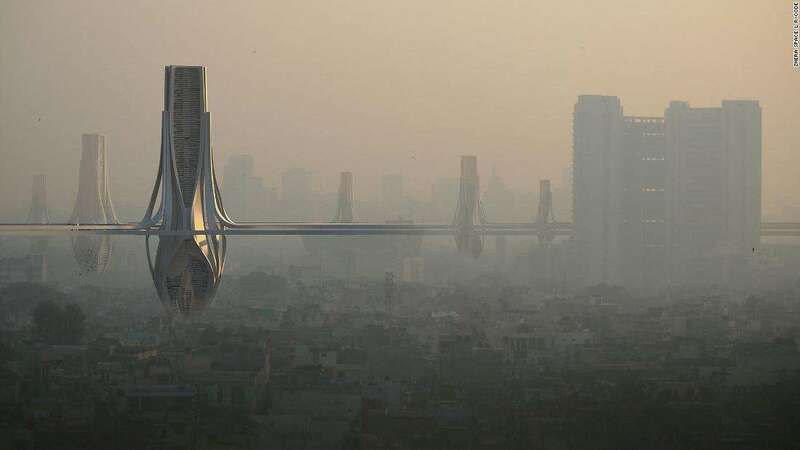 The Smog Project comprises a vast array of 328 feet-high air filtration pods, each capable of producing more than 353 million cubic feet of clean air per day, serving an area of 100 hectares, say their designers. The architect is in talks with AirLabs in Copenhagen, a startup specializing in clean air technology, who Chowdhry says could produce simulation models for the design. But Znera is still looking for development funding. Chowdhry says as well as exploring opportunities in India, he will also look to the UAE. He notes Dubai has experienced severe dust and sandstorms in recent years and could also utilize the technology. The design is notable for its scale, however it's far from the only urban air filter in development. Dutch designer Daan Roosegarde's 23-foot "Smog Free Tower" was unveiled at Beijing Design Week 2016, capable of cleaning approximately 25 million cubic feet of air a day. "CityTree," a 13-foot by 10-foot mobile installation by Berlin-based Green City Solutions, uses a pollution capturing moss culture equivalent to 275 trees, the company claims. "Considering the limitations of the technology in terms of its area coverage to treat widespread air pollution in the Delhi city, this is not the only solution we must rely upon," he argues. "For long term wider scale air quality improvements, emission mitigation measures are required at the respective sources." The winners of the World Architecture Festival will be announced between November 28-30 in Amsterdam, the Netherlands.